After firing Jim McElwain halfway through a disappointing season, the Florida Gators were on the hunt to find a new coach that could return the team to its former glory. Rumors of different names like Chip Kelly and Scott Frost were floating around, but after Kelly took the head coaching job at UCLA, the Gators finally decided on Mississippi State head coach Dan Mullen. Dan Mullen seems like the perfect candidate to revitalize the Gator offense and bring a championship caliber team back to Gainesville. Mullen also has history at Florida; he coached as the offensive coordinator and QB coach from 2005 to 2008. During this span the Gators won two national championships and boasted one of the best offenses ever seen at the school. 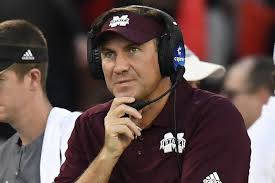 Mullen was also very successful at Mississippi State, turning a Bulldogs team that only had one winning season the previous eight years to a team that had seven winning seasons in his nine seasons as head coach and was consistently a serious contender in the tough SEC West division. One of Mullen’s biggest strengths comes in an area that is needed desperately by the Gators: developing quarterbacks. The last time the Gators had a reliable and consistently good quarterback was Tim Tebow when the Gators QB coach was none other than Dan Mullen. Mullen also showed his quarterback talent at MSU with star QB Dak Prescott, who broke many records and was regarded as one of the best quarterbacks in the nation during his time at MSU. Replacing him was the current quarterback at MSU Nick Fitzgerald, who again has been very reliable and successful, leading the Bulldogs into the Top 25 rankings once again. “He knows quarterbacks and that’s what we need so I’m excited to have him as our coach,” says Gators fan Jackson Rowland. With his impressive coaching record, history with the school, and repeated success with developing quarterbacks, it seems Dan Mullen may be the perfect man to get the Gators out of their slump and make Florida championship contenders once again.